Most entrepreneurs and inventors look forward to the day when their product or business is seen on television. Being on TV can have a major impact on consumer awareness and creating reputable brand awareness. You could potentially reach thousands of viewers with one regional broadcast segment and millions of viewers on a national television segment. When a product or business has a unique or moving backstory or a timely, relevant news angle that will resonate with viewers, it’s a perfect fit for television. Securing a TV interview means the business owner or company representative may need to go to the station and do a sit-down interview. Other times, the station may send a camera crew out to you – be it a corporate headquarters, manufacturing facility or home office. If you’ve never done a live interview, there’s a lot to know beforehand because it can be intimidating. If you have done a TV interview, great, but chances are the next one will be completely different. We’ve put together a brief media training with some tips on giving a great TV interview. Learn all that you can so you know what to expect about the interview. Some of the questions you will want to find out answers to include: How long will the interview be? Most are typically 3-5 minutes. Always best to confirm and get an approximate time frame – it could be shorter or longer. Will it be taped or live? Will there be any editing or will the interview air as-is? Does the station want video clips or other visual materials to show during the interview? As a general rule of thumb, journalists do not give out their interview questions ahead of time so don’t ask for it. Know your key messaging and talking points. Make sure it’s clear to the average, everyday person. Work with your Publicist to create mock questions that the reporter will possibly ask during the interview and then come up with answers. Practicing will help you work out any verbal nuances such as ‘ummm,’ ‘you know,’ and ‘like I said.’ Your answers should be short and succinct. The conversation should flow. Don’t ramble! People get themselves in a tricky situation when they start going on and on and saying too much. Answer the interviewer’s questions with a couple sentences and then pause. They will take it from there and ask their next question. Being in front of a news camera can be nerve-wracking especially if you’re not accustomed to public speaking. Take a deep breath and don’t let nerves get the best of you. Practice deep breathing exercises and drink some water before the interview. It will help to calm you down. And remember…you got this! It’s your business, your ‘baby’ so to speak, so get excited about it! If you’re not excited then no one else will be. A quiet, monotonous tone will not resonate well. Use an energetic tone of voice and you will get the attention of viewers watching at home. Plus, if you do a great job the first time, the TV station is more likely to invite you back for a future segment. Follow these media training tips and you will have a fantastic interview! 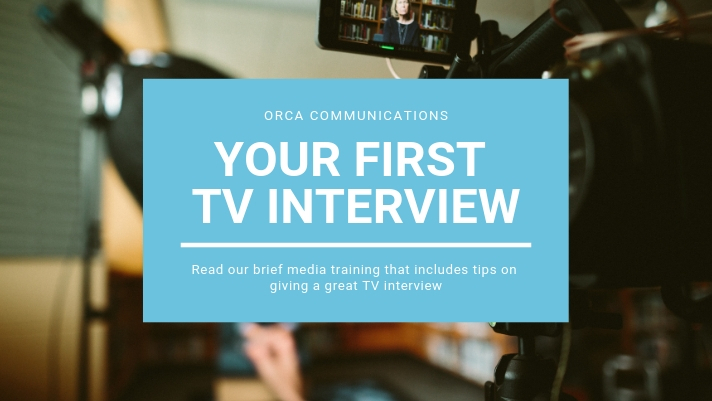 The team at Orca is made up of many former TV news journalists and we excel at arranging TV coverage for our clients, so do not hesitate to reach out to us if you have questions or need additional guidance.